iSimangaliso Wetland Park covers five interlinked ecosystems along a 220km stretch of coast, including Lake St. Lucia. Wildlife includes nesting turtles, whales, dolphins, whale sharks and waterfowl. It is situated on the east coast of KwaZulu-Natal. The park includes the St Lucia Game Reserve, False Bay Park, St Lucia Marine Reserve, Sodwana Bay National Park, Maputaland Marine Reserve, Cape Vidal, Ozabeni, Mfabeni, Tewate Wilderness Area and Mkuze Game Reserve. The park was formerly known as Greater St. Lucia Wetland Park. It was renamed into iSimangaliso Wetland Park effective from 1 November 2007. The word 'isimangaliso' is Zulu for 'a marvel'. iSimangaliso Wetland Park lies well on the main tourist trail around South Africa. It’s a huge park, stretching for 220km along the Indian Ocean coast until the border with Mozambique. It also has a 5 km wide marine component along the whole coastline. I stayed for 3 nights in the town of St. Lucia, which is the tourist capital and main access point to the park. Because of its size, there are completely different ecosystems to be enjoyed. For the marine part, I had set my eyes on a whale watching tour. But unfortunately it was cancelled due to strong winds. So what I mainly did was drive around by myself. From St. Lucia there are two gates into the park, one to the Eastern Shores and one to the Western. The park is remarkable for South African standards as it is very green. No shortage of rain here, compared to the severe drought much of the rest of the country suffers from. On my first morning I entered via Bhangazi Gate, which leads you to the Eastern Shores ending at Cape Vidal. For the best part the drive goes through a savannah. Prominent inhabitants are the Greater Kudu (quite big indeed) and other cloven-hoofed mammals such as the Common Reedbuck. All loop roads from the main road were closed for maintenance, but the various viewpoints were accessible. They will give you views over the coastline, one that is remarkably similar to the all-too-familiar Wadden Sea. This road ends at a wooded area, where two species of monkey play around. The Vervet Monkeys occupied their usual spot at the parking area, looking for any left-over food from human beings visiting the beach here. More special are the Samango Monkeys, who kept their distance. They’re a subspecies of the Blue (or Sykes') Monkey. On the way back I stopped at the Catalina Bay lookout, probably the best viewpoint of this side of the park. It overlooks Lake St. Lucia. Later that day at 4 pm I took part in the most touristy thing you can do here: a Hippo & Croc Boat Tour. I was already sceptical beforehand, but it’s the only way to see some of the park from the water. The boat travels the estuarine system into Lake St. Lucia. There are many operators offering this tour, and they all visit the same spots at the same time (so you have to wait your turn at each stop). Imagination and variation is not a strong point of the South African travel industry in general – they cater to the mainstream, to the first time visitor to Africa. 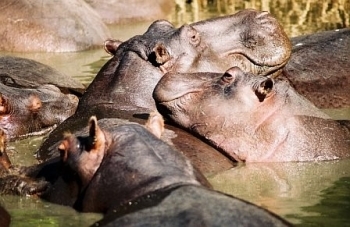 The boat slowly navigated the estuary, hitting the favourite spots of the hippo’s. Sightings of these are abundant, and as always they are fun to watch. We didn’t see anything else of interest, besides two almost hidden crocodiles and a fish eagle. The next day I entered the park at the Dukukduku (western) gate. This part seems to have more mammals than the one I visited the day before. The road was blocked by a large male elephant so I had to wait a while until he finished his breakfast. There are also large herds of wildebeest here, as well as zebra, giraffe and various antelopes. Scenery wise it isn’t as attractive as the Eastern Shores. During the evening I took a night drive tour, also into this western part. As it was raining slightly, we got very cold. The only remarkable creature of the night we saw was a Bushbaby. iSimangaliso nowadays advertises itself as a Big 5-park (or even a Big 7). I find that a pity, as its unique setting for Southern Africa and water-related features should be their main selling point. These features are now difficult to enjoy. I did see few birds for example, I think the site could do with some good bird hides. South African parks are obsessed by the Big 5, and they reintroduce species frequently to reach the 5 (iSimangaliso got lions again in the last few years). This seems to be not only the policy of the main parks managed by the SAN, but also that of the many private game (and hunting!) reserves the country has. In Mapungubwe I was staying in one of those, and the staff told me that they just bought some elephants and were already planning for adding rhinos. I visited the Sodwana area, that is linked to the iSimangaliso Wetland Park, for the first time this past December as a diving vacation. Although the diving was great I have to admit that the experience was tainted by reports of racism and hard-handed treatment of guests to the park by park official - specifically on New Year's day. There are apparently some video evidence of the teargassing of a family trying to leave the park on the 1st of January and I hope that the owner will also publish that. The mess that greeted us on the 2nd of January, when we wanted to dive again, was also not becoming of a World Heritage site. Despite a "No Alcohol" rule on the beach, the road to the park, as well as the beach was littered with empty bottles and other rubbish. This only finally cleared after about 2 days. This is such a sad state of affairs, since the area is really great and the reef is great for diving! Hopefully enough people will make their voices heard to force some kind of action on this. The St. Lucia estuary is one of the unique biosystems on this planet, with the subtle interplay between marine and terrestrial aquatic life. This is the only place where I've seen sharks swimming in the lagoon next to hippopotamuses, and crocodiles swimming in the sea! There are many beautiful woodland paths to explore and the warm Indian Ocean is great for swimming. This is also the only place where I've seen a barracuda jumping over the surf, from the shore! There is an abundance of fauna and flora to admire in the protected areas as well. The cheapest way to stay is on one of the camping grounds, although there is luxury accommodation as well. Public transport is poor so it is recommended that you make your own arrangements to get around. From "Greater St Lucia Wetland Park" to "iSimangaliso Wetland Park"
Reintroduced Species: "In 2001 Elephant was introduced into the wetlands system and this has brought this area closer to "big five" status and has re-introduced a key ecological vector". And "Wild dogs, last seen in the northern parts of KwaZulu Natal more than 75 years ago, were reintroduced into South Africa's Greater St. Lucia Wetlands Park on May 5, 2005"
Holocene: See "Formation of Lake St Lucia" on page 3 of the linked pdf.